NEW YORK, Oct. 08 /CSRwire/ - The recent BSR and GlobeScan State of Sustainable Business 2018 survey is a great testament to the progress of corporate action on sustainability and provides insight into how companies are preparing for the next 10 years as they respond to a rapidly changing world. It includes responses from business leaders representing 152 global companies—more than 60 percent of BSR’s global membership network. This is the perspective of the people who do sustainability and corporate social responsibility work every day, inside some of the largest and most influential companies in the world, and we have used it to inform the agenda for BSR18: A New Blueprint for Business. This year, we updated the list of corporate sustainability priorities that we track to reflect the evolving business landscape. Interestingly, ethics/integrity and diversity/inclusion were on the list for the first time and jumped straight to the top two priorities for sustainability efforts over the next 12 months. While these are of course longstanding corporate issues, they are now increasingly viewed as part of the sustainability agenda—perhaps a reflection of global attention on these topics. Join BSR18 sessions on Power Imbalances: What Have We Learned from #MeToo? and Racial Injustice: A Blind Spot for Business? to hear how companies are navigating these issues. Climate change and human rights have been the top priorities in the survey throughout the past decade, and they round out the top four. BSR18 will feature conversations on what these issues mean for business today, including how to implement the TCFD recommendations, climate’s impact on upstream supply chains, and what effective remedy through grievance mechanisms looks like. There appears to be less interest in issues more closely related to public policy, with one third of respondents stating that public policy frameworks are a low priority and only 11 percent stating that they want to influence policy frameworks to address new global opportunities and challenges. Yet this is at odds with public concern about corporate influence over public policy, which is something business will increasingly be expected to address. It’s Time to Take a Stand on Social Issues will explore how companies can do this in a meaningful way. We also see that business is anticipating and responding to global mega-trends in order to create more resilient strategies for long-term success. Disruptive technologies like artificial intelligence and blockchain are clearly shaping business strategies, which is why we’ll be talking about them and what automation means for the future of work. Perhaps the most exciting finding is that three quarters of corporate sustainability professionals say that sustainability needs to be better integrated into business strategy to the create resilient strategies necessary to address these global shifts. As one executive told us in interviews for our recent report on Redefining Sustainable Business, “Most big businesses have been working on sustainability with reasonable success for the last 10 to 15 years, but we have been picking the low-hanging fruit, and the next phase will be much more difficult. It is about what you buy and what you sell; it goes into the heart of your commercial operations and investment decisions.” This fall, you can be part of the discussion about what a 21st-Century Business Strategy should look like and how you can create one. While recognition of the need to engage with the strategic planning function is growing—it increased from 23 percent to 33 percent in just one year—sustainability teams still struggle to get traction with such engagement. Our session on How to Become a Change Agent will arm participants with an understanding of how to better collaborate with their peers to create transformational change. 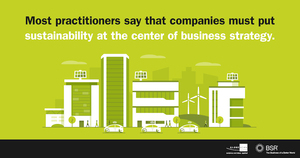 This year’s BSR/GlobeScan State of Sustainable Business survey findings reinforce that now is the time to embrace a New Blueprint for Business. Join us at BSR’s annual Conference in New York this November, where together we will redefine business in pursuit of a more just and sustainable future.